He's all grown up and it's time to leave the nest. This Great Horned Owlet has matured and ready to begin his new life hunting and soaring over the fields and forests of Red Ridge Durant Vineyards. Other avian ambassadors will be in attendance for your enjoyment and photographs, so bring your camera. 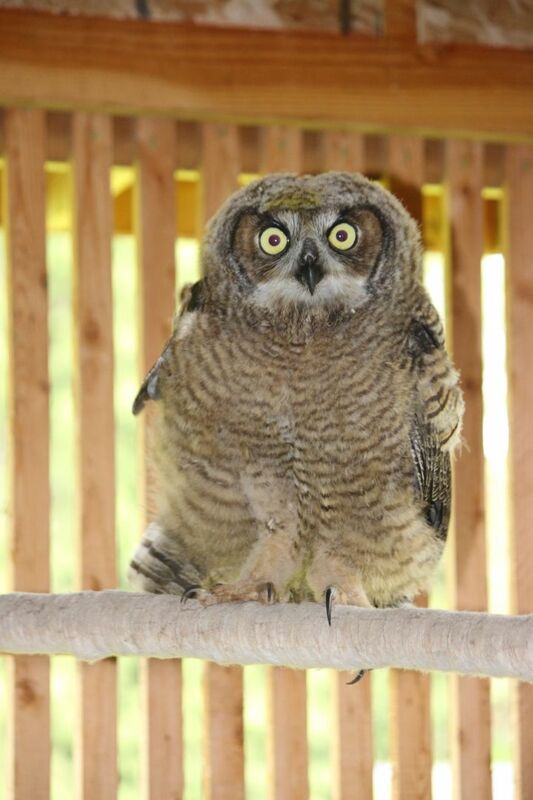 This orphaned owlet was rehabilitated at Turtle Ridge Wildlife and they will receive funds from this event. Wings over Wine is a program of Perch, a 501(C)3 organization that provides wildlife education and support for local, licensed wildlife rehabilitators. We engage in wildlife education utilizing non-releasable, rehabilitated live birds of prey including owls, hawks and falcons, often at wineries. Sometimes, when our habitat, topographical and legal requirements align, we are able to coordinate the release of a rehabilitated raptor at a vineyard. Vineyards can make exceptional release sites as agriculture invites a higher concentration of agricultural pests, such as starlings, which a released raptor is happy to prey upon. Usually, vineyards are situated a distance from areas with high vehicular traffic, reducing the likelihood of a car strike which accounts for many of the injuries sustained by wildlife. All species of native wildlife are cared for by the local rehabilitators, but the most frequent of the raptors are the most populous who reside in areas close to human activity, including red tailed hawks, great horned owls and barn owls. Since we began 2 years ago, we have been able to release 10 birds of prey in qualified vineyards. While all of been memorable, some have been particularly poignant such as our very first at Oswego Hills Vineyard and Winery when a barn owl was released in memory of a fallen Marine CPL Keaton Coffey on the Memorial Day weekend anniversary of his passing. With incredible generosity for the wineries and their guests, we have be able to provide substantial funds to American Wildlife Foundation and Turtle Ridge Wildlife Center to assistance in the amazing work that they do. The best part of Wings Over Wine is the public. Many people have never looked into the eyes of an owl and many are forever changed when they do and reevaluate how view nature and the environment. Also, people are deeply touched when a wild animal returns to where it belongs. There is seldom a dry eye in the house.